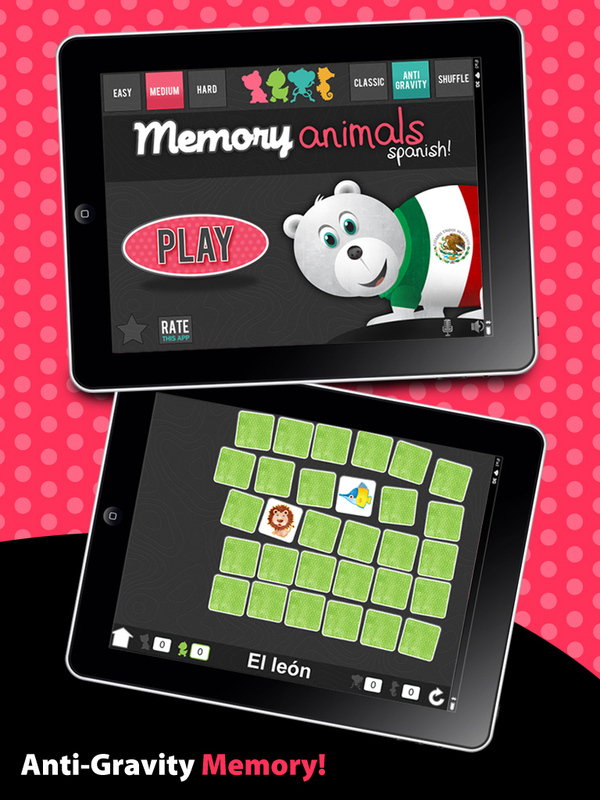 Learning Gems has brought all the fun of "Memory Animals" into a delightful Spanish app! This is perfect for introducing young children to Spanish. 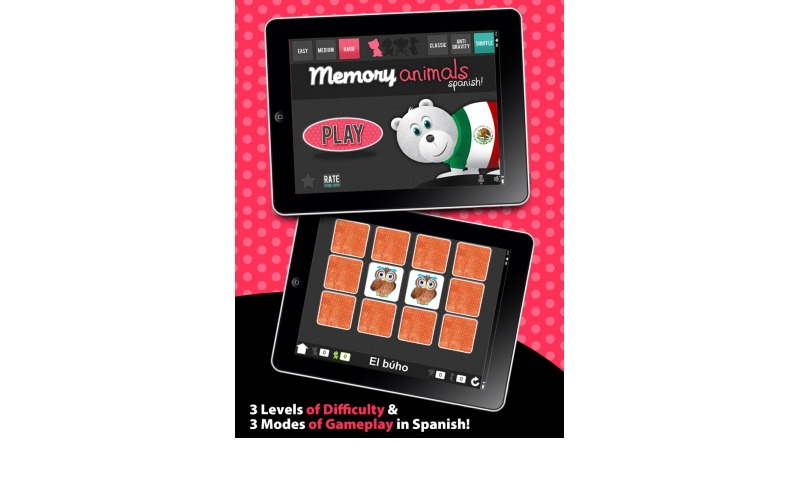 This app features tons of cute animals and multiple styles of "memory" gameplay. 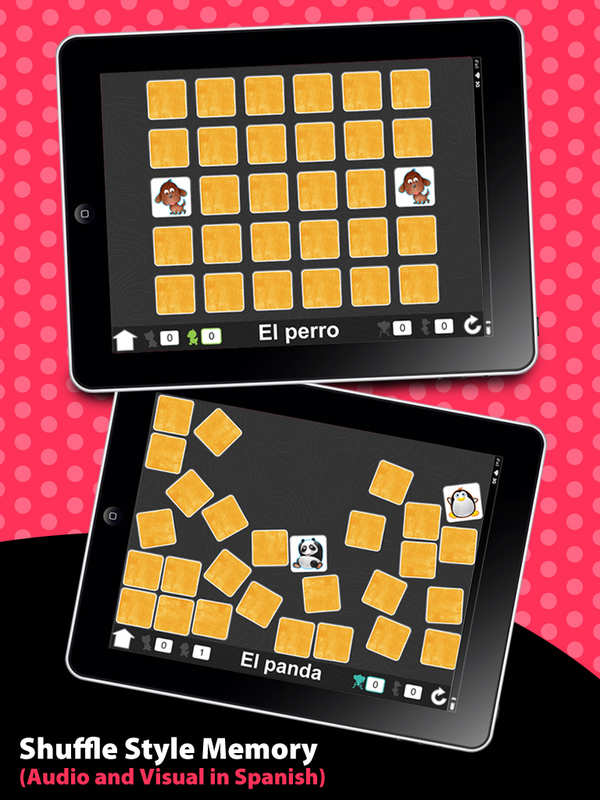 Each time a card is flipped over, you will see the animal, hear a Spanish audio clip for the name of that animal, and be able to read the name of that animal (in Spanish) at the bottom of the screen. 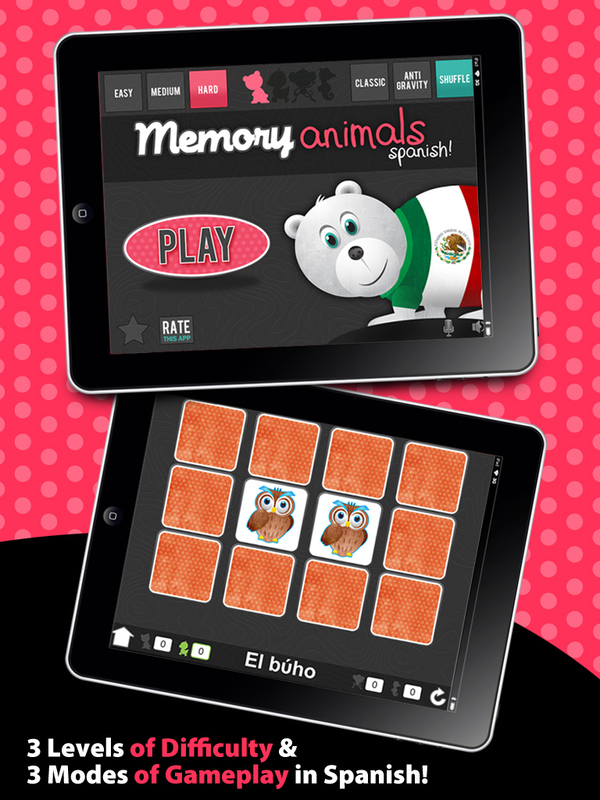 This app is great for reinforcing animal names to help your child associate and learn the Spanish pronunciation of them while they play! You can choose from three levels of difficulty, which makes it accessible for young toddlers, while also allowing more challenging levels for older children and adults. 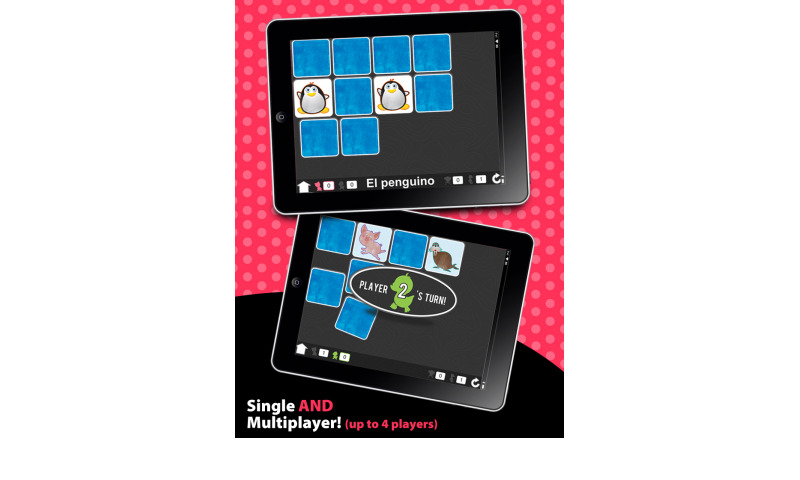 Try our advanced gameplay modes for even more fun! 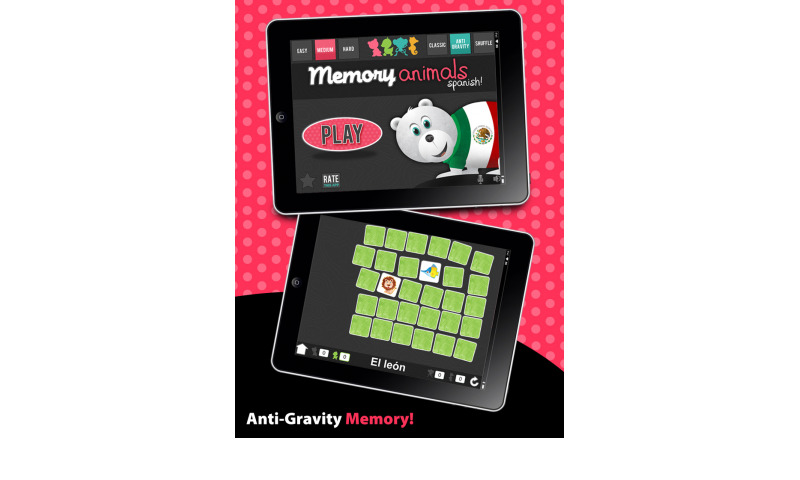 Anti-gravity and Shuffle mode provide a "memory" experience like you've never had before! Your kids will love playing this app. With single and multi-player modes it's awesome for challenging siblings, friends, or parents to a game. The audio was recorded by a Spanish teacher who works directly with Hispanic youth. 3 play settings (easy, medium, and hard) - controls how many cards you are dealt and the level of challenge you want to play. Classic mode - lets you play the traditional "memory" style game. Flip two cards at a time and try to make a match. Anti-Gravity mode - we kick things up a notch with this setting. The entire deck of cards shifts throughout the screen as you try to make matches. Keep your memory sharp while keeping track of where cards were located as they shift and fall into gaps. 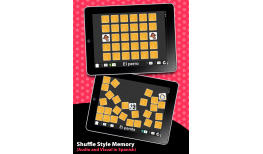 Shuffle mode - this mode offers another fun and challenging style. When a match is made cards will shuffle in a burst of movement. Multi-Player capabilities!!! 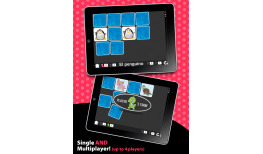 Learning Gems Memory - Animals allows up to 4 players to play at one time! 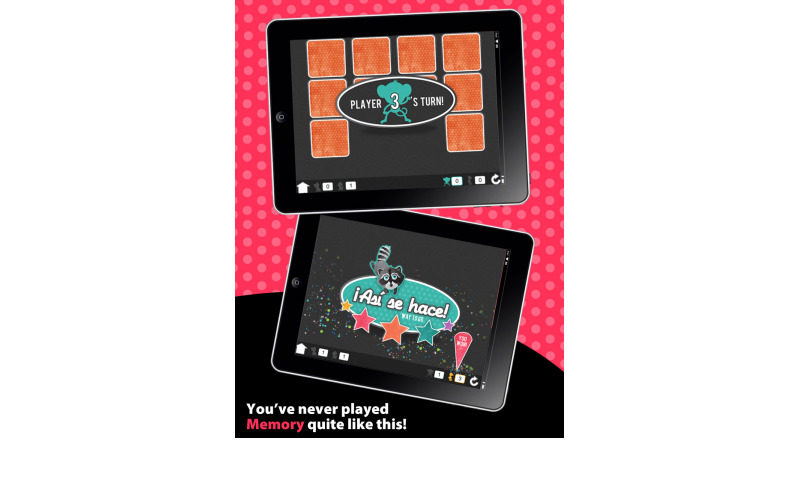 Challenge your family and friends to a game of memory! 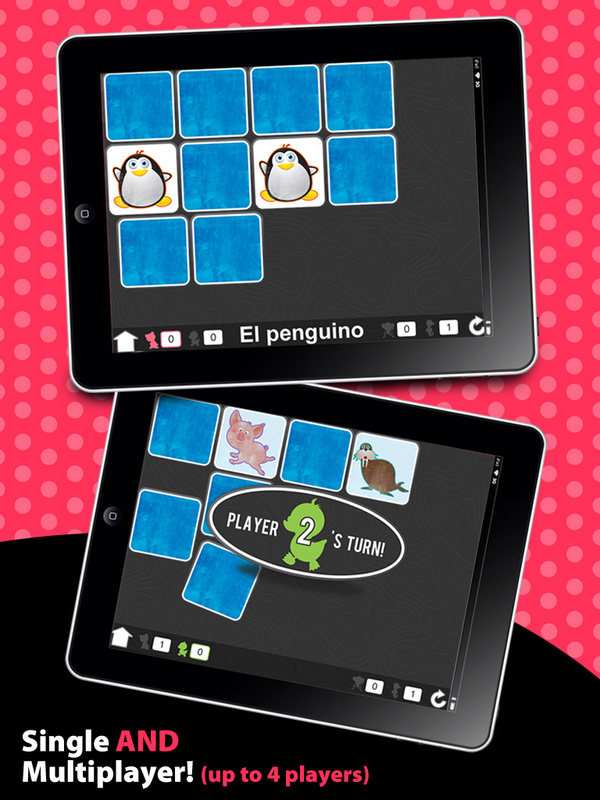 Spanish Audio and Visual animal cues - when each card is flipped, the name of the animal appears at the bottom of the screen (in Spanish), along with an audio clip of that animal's name spoken in Spanish. This is another great learning reinforcement for kids to help them learn their animals and have fun doing it! If you prefer to play the game with no audio sounds, you can turn off the vocals on the home page. Adorable, colorful graphics!! Multiple card backs in lovely colors! 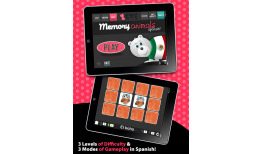 Great for developing cognitive learning skills in young children and reinforcing them in adults. Cute, retro feel makes it fun for adults to play too! 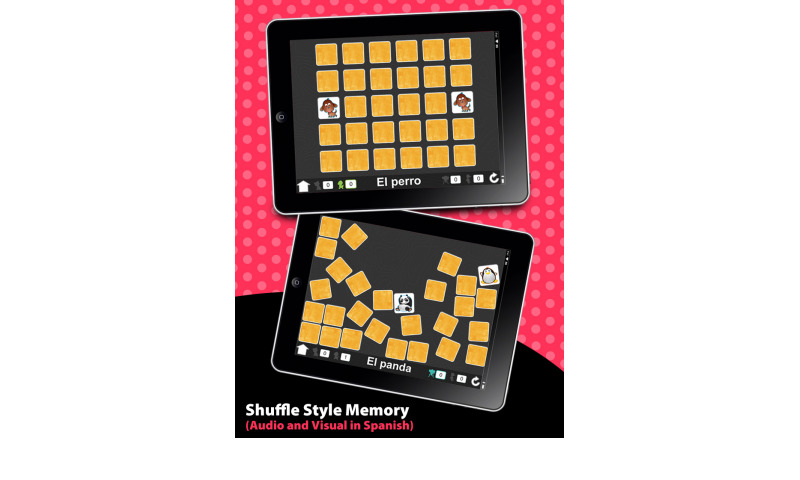 It's a great brain builder to exercise your memory! 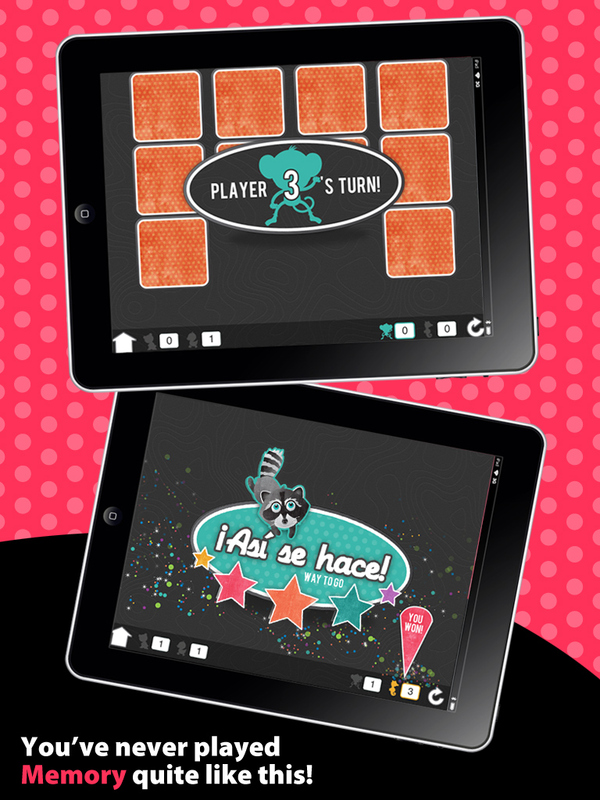 Perfect for all ages - great for anyone just learning Spanish, or for those who already know the language to use for practice and fun!